Time to get out cragging and knock those lead climbs off, ready for your Rock Climbing Instructor assessment! Having completed your Rock Climbing Instructor (or Single Pitch Award) training you will already have a number of lead climbs, outdoors, with leader placed protection, under your belt. Now the fun part of Rock Climbing Instructor begins – getting out on the crags climbing – not only to log the minimum 40 routes, but hopefully aiming for 60+. This will not only show your commitment, it will make you a more competent and a slicker climber. My tip is to go for mileage initially; your grades will soon start to tumble (no pun intended). Chose a crag with a good selection of easy grade routes, working your way up to being confident on Severe 4a (as that is the grade you are more than likely to be assessed on). It’s good to climb on as many different rock types and areas as you can, as this will add to your depth of experience, as well as meeting the assessment criteria. The harder grades – if this is where you want to go – will soon become accessible with a mileage approach. Chose routes that have a good selection of gear placements, corners, crack lines etc. Chose routes with good rest positions for placing gear. Look for well protected routes, have a look up the route before climbing, refer to your guide book and check out routes with other climbers. Check out the tops of routes for good ,secure anchor placements for belays that are in line with the route. 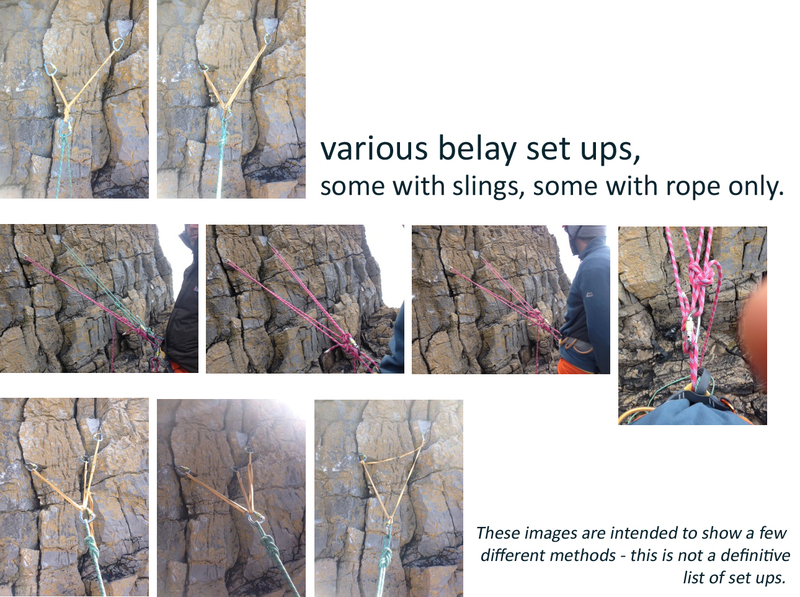 Practice setting up your belay by equalising your anchors using rope only. This is a good alternative to equalising with slings (if you have enough spare rope!). Don’t forget that it is good to keep the angles between anchors at no more than 60°. (see photos of various set ups). Select nuts etc. to give a deep seated placement ,with the nut well contoured in. Don’t worry about it being difficult to get back out – you can always give your second a tight rope, or if necessary lock the belay device off, so that they can use two hands if they have to. If you are not familiar with using two half ropes give it a try; there are a number of advantages, for example it can reduce rope drag, traverses are easier to protect and it helps to prevent your rope from zig-zagging. Get out with as many climbing partners as you can; if possible, occasionally climb with some more experienced climbers to pick up some more good tips. How many times have we all been out cragging with a big tick-list of routes, but have managed only a couple of routes in the day? Try these time savers to get the most out of your day. Think mileage – don’t set you expectations too high. Your grades will soon start to improve, and the big ticks will happen in time. Do your homework before you go. Check out crags in guide books and with other climbers. When you finish the route check out the most efficient way down. It may save time abbing back down if there is a long walk off. Don’t forget to safeguard yourself with a prussic. Sort your gear out and re-rack when you finish, ready for the next route. 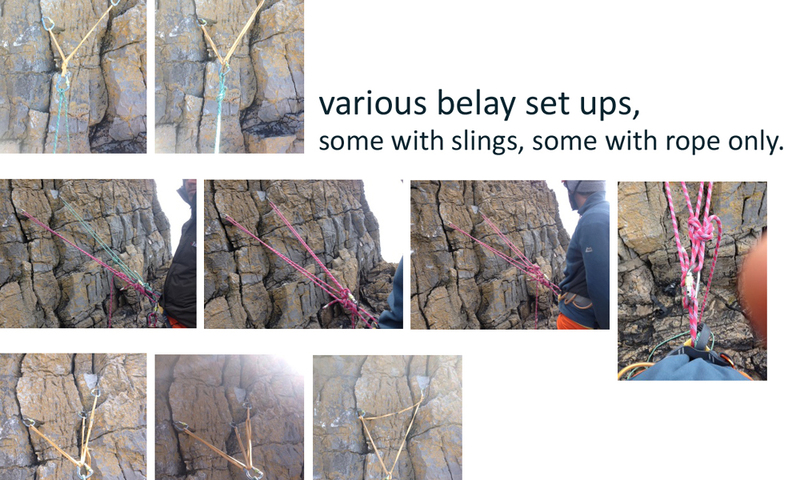 Get your second to do some work coiling ropes, while you are stripping the belay and sorting the rack. Have the next route in mind, rather that spending loads of time searching when you get back down. While you are having a final look at the route, get your second to pay the ropes out in readiness.